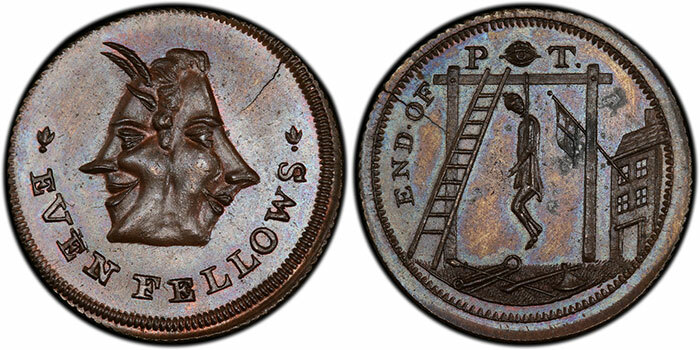 Since this week is Halloween, I wanted to dig into the dark side of numismatics and share with you some tokens that have an ominous past. These tokens were privately struck/minted in the late 18th century and early 19th century by companies in England, Anglesey, Wales, Scotland, and Ireland. Increasing populations and the Industrial Revolution created a shortage in small denomination coinage, and employees needed to be paid. Also, with the French Revolution still taking place at this time, tensions were high, and there was a hatred for many political figures at the time. One of these political figures was Thomas Paine. Born in England, in 1737, Thomas grew up to become a Philosopher, Author, and Political activist and even motivated the patriots to declare independence from Britain in 1776. Below are some examples of how Great Britain felt towards Thomas Paine and others. 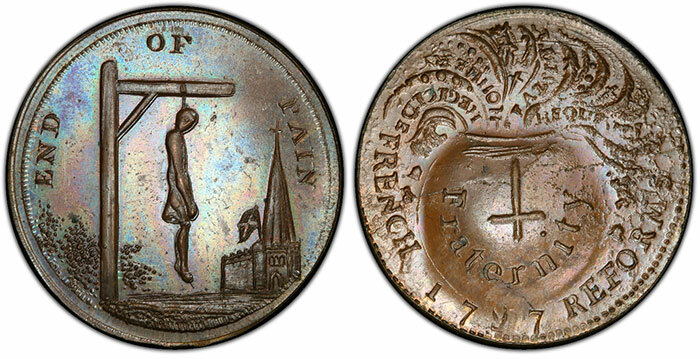 Obverse: Thomas Paine hanging from a gibbet with a church in the distance, “END OF PAIN” inscribed above. Reverse: An upside-down cross with the word “FRATERNITY” inscribed below. “FRENCH REFORM” inscribed around “1797”. Above “REGICIDE, ROBBERY, FALSITY, REQUISITION” Are inscribed in the waves coming from the cross. Obverse: Thomas Paine’s head looking right connected to the devil looking left. "EVEN FELLOWS" written below. Reverse: Thomas Paine hanging, above an all-seeing eye looking forward with "End OF" inscribed around to the left of Thomas Paine’s initials "TP". A structure in the distance with the flag of England hanging down. Obverse: Three figures hanging from a Gibbet "NOTED ADVOCATES FOR THE RIGHTS OF MEN" Around and 1796 below. This image is most likely Thomas pain and others who supported the revolution. 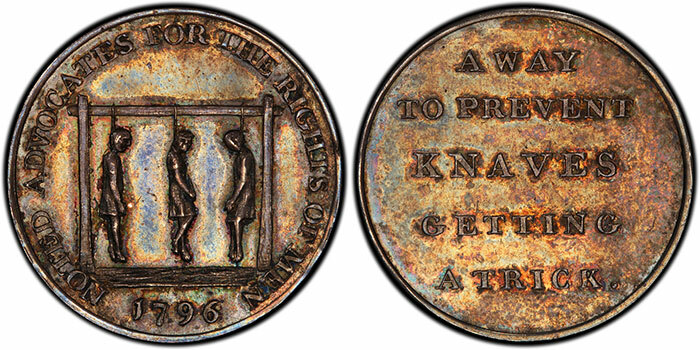 Reverse: "A WAY TO PREVENT KNAVES GETTING A TRICK" inscribed on the reverse. This text refers to a dishonest man trying to outwit or deceive someone. Obverse: Thomas Paine hanging from a bare tree with a cartoon bubble coming from his mouth saying, "I DIED FOR THIS DAMN’D BOOK". The book he is holding is "Rights of Man" that he published in 1791. Through the branches "TOMMY’S RIGHTS OF MAN" is inscribed. Inscribed above "A TREE IS KNOWN BY ITS FRUIT" with a church in the distance. 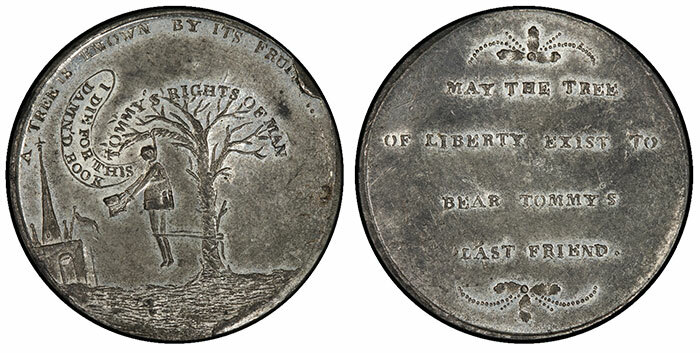 Reverse: "MAY THE TREE OF LIBERTY EXIST TO BEAR TOMMY’S LAST FRIEND". A floral design above and below. During this time, there were thousands of different designs being produced by private mints. Due to the rush to replenish the small denomination coinage, the standards were thrown out the window and each mint could create what they wanted. Luckily, as a result, we ended up with some extremely creepy and fascinating designs.